A second defibrillator has been installed in the town at the Alton Community Centre outside on the right-hand side of the entrance and is accessible day and night. Clear instructions are printed on the front of the cabinet next to a key-pad for people to follow in the case of an emergency. First people should dial 999, then keep calm and follow the instructions. The defibrillator is designed to save people who may have a heart attack when out in this area of Alton when in such cases, every second counts. 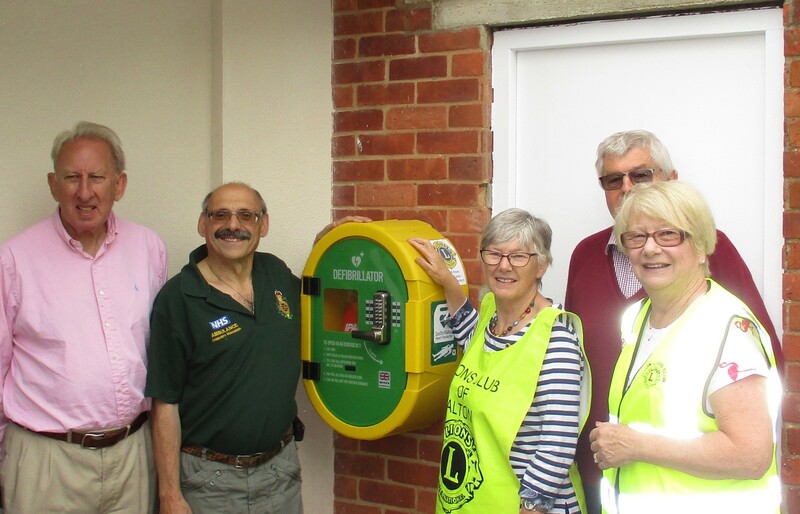 The defibrillator has been funded through the Alton Lions Supporters Club and has been organised by Lion Sarah O’Donoghue together with Alton Community Centre and East Hants District Council (owners of the building). Alton Lions Club “value our Supporters very much” as they help at events when extra people are needed. Alton Lions Club Supporters contribute £1per month to a monthly draw and whilst some of this is used for prizes and the majority is used for valuable projects such as the defibrillators. Alton Lions Club (CIO) (Reg No1174502) encourages volunteers and welcomes new ‘Supporters’. Come and meet us at the monthly Craft Market in Cross & Pillory Lane or direct contact can be made by e-mail alton@lions105d.org.uk or call 0845 701 8332. Launching the second defibrillator at the Community Centre from left are East Hants District Councillor Graham Hill, John Jacobs from South Central Ambulance Service, Lions Sarah O’Donoghue, David Hodder and Janet Gwynne.